Most of the Chief Financial Officers (CFOs) generally get involved into diverse projects within their organizations with the skills and the experience that they have. However, there are various challenges for the finance leaders who have to use all the tools which are available at their disposal for making decisions. 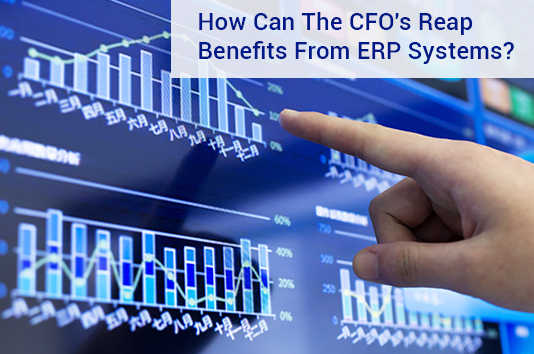 An investment made into the ERP can actually make a difference to the CFOs. There are businesses small to mid which rely on the ERP software for gaining greater insights and controlling the business operations. There are still many more software’s that need to be launched for integrating, implementing, training and other issues. There are many CFOs who are missing out on the potential efficiency, information accuracy and the cost benefits. Once the new AY year starts the finance leaders should be considering the ERP systems that help in adding value to their organization. Most of the CFOs are concerned about the revenue growth within their organization and some are worried about keeping up with the regulatory changes. There are some who are even concerned about meeting the quarterly financial goals and managing the enterprise risk. Even if the economy recovers, CFOs have plenty things on their minds even as they attempt to manage their organizations finance functions effectively. Creating a proper financial report which can be used Creating a proper financial report which can be used in real-time for viewing the processes that offer real values to the CFOs to establish a growth foundation. There are various opportunities for expansion that are emerging across different sectors. ERP solutions are used for offering values by integrating the data across various departments or organizations for automating the processes. The processes can be freed for focusing on the different alternatives. With ERP systems the CFOs are the ones that gain real-time insights as to what is happening with the financial functions. It helps in managing the income and the expenses effectively, monitor the orders and keep a control over the stock. The finance chief is generally keeping a look as to what is going in and out of the business. CFOs have access to all the information from a single location and this is where ERP adds a value to them. The data which exists in the silo is of very little use to the financial chief their decisions are based upon the different variables which are impacted based upon each other. This obstacle is overcome by centralizing the data in the ERP system. These solutions are the one which help in giving accurate information. It is crucial for cash management as the CFO is responsible for the sizeable budget. Even the minor mistakes can prove to be costly. Where the organization cost comes in implement an ERP will let the CFO identify the potential efficiency and enable to reduce the cost. Integrating the data will help the processes to be redundant. This means that they no longer would need a support to preserve the valuable budgetary resources. The organization whether embrace an ERP on premise, software-as-a-service or a cloud based solution as the principle applied will be the same throughout. ERP solutions are the ones which offer more cost-effective way of collecting, managing and analyzing the data which helps in decision making. CFO plays a very important part in this system. There are plenty of companies which have run into difficulties and the executives keep a close eye on the bottom line. CFOs are the one which ensure that they can add value to the finance functions in the organization. Is your business ready to fly in the cloud? The time is right to make the switch to ERP. Inspirria is your trusted partner to assess and understand your company’s exact requirements which will enable you to be a Cloud powered enterprise. We are the Premier Partner of leading Cloud product companies like NetSuite, Workforce Software, Google, Box and Docusign and are the largest NetSuite Solutions provider in Asia.